Mixed clouds and sun with scattered thunderstorms. High near 65F. Winds NNW at 5 to 10 mph. Chance of rain 60%..
Showers and thundershowers early, then mainly cloudy after midnight with light rain possible. Low around 40F. Winds WNW at 5 to 10 mph. Chance of rain 100%. 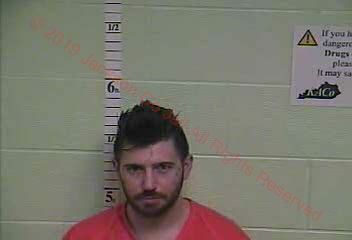 Logan Carpenter, 28, of McKee, KY appeared in court for a preliminary hearing and stipulated to certain charges. The case was sent to the grand jury. Logan Carpenter, 28, of McKee, KY appeared in court for a preliminary hearing and stipulated to certain charges. The case was sent to the grand jury. Carpenter was arrested on March 31st, 2019 by KSP Trooper Nick Brumback. According to the uniform citation, Trooper Brumback received an anonymous tip that Carpenter was selling large amounts of methamphetamine and heroin. For the rest of the story check out the April 10th, 2019 issue of the Jackson County Sun!